As a response to the 9/11 attacks, the International Ship and Port Security code (ISPS) came in to force 1st July 2004. Thus, 10 years have passed, since merchant ships in international trade and the ports they are calling, were required to be certified to a certain security standard. Contrary to previous conventions and codes, the creation of the ISPS-code was caused by a disaster that happened ashore, when hijacked aircrafts on the 11th of September 2001 flew into the twin towers of the World Trade Center, destroyed part of Pentagon and crashed on a field in Pennsylvania. In peace time, to facilitate trade, merchant ships have traditionally been entering territorial waters and ports without much hindrance. The embarkation of port authorities, with clearance and free pratique granted has occurred once the ship was alongside a berth or at a customary anchorage. With such an easy access to seaports, security experts were of the opinion that merchant ships could be used as a tool by terrorists. Different scenarios were developed, where merchant ships were means of transportation of terrorists and their weapons, or that the ship in its own right was a weapon. 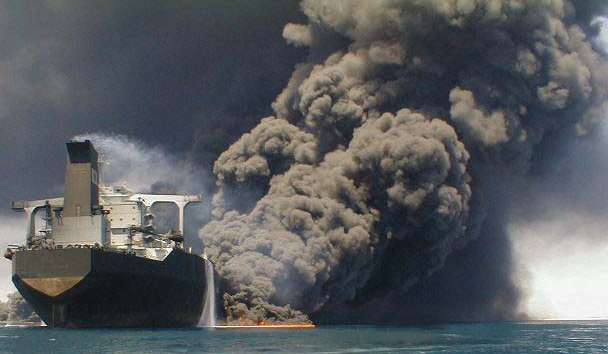 An example given was the risk of gas ships being hijacked and blown up in busy seaports. Urgently, legislation was needed to protect both merchant ships and seaports. At a Conference of Contracting Governments to the International Convention for the Safety of Life at Sea (SOLAS), held at IMO headquarters in December 2002, The International Ship and Port Facility Security Code was adopted. A code written and adopted, just in little more than one year after 9/11, must have been some kind of record. The time period from adoption to enforcement was also very short, only 18 months had passed when the Code came into force on the 1st of July 2004. During that one and a half year some 50,000 ships were certified, and hundreds of thousands of seafarers and office personnel were educated for their new roles as Ship Security Officers (SSO) and Company Security Officers (CSO). An equally daunting task, port facilities on all continents, with personnel, should be certified and educated. Thus, war, piracy and stowaways are threats that the shipping industry has been dealing with for a long time. Administrations and ship owners´ associations have for decades been issuing regulations and instructions in an attempt to assist seafarers to deal with the perils. For example, during the cold war, all Swedish ships were by the Swedish Maritime Administration issued with an instruction about how to act during crisis and war. Some 30 years ago, with the appearance of modern piracy, the International Maritime Organization(6) and the International Chamber of Shipping(7) issued guidelines. Similar to the ISPS-code, not only ships are considered as objects for maritime terrorism, but also port facilities. Maritime terrorism is not rampant, nevertheless there have been a steady flow of incidents during the last 50 years. The Global Terrorism Database (GTD) at the University of Maryland(12) is an open-source database on global terrorist incidents (including maritime), covering events from 1970 through 2012. Still there are some significant incidents that got an extensive media coverage. – Shadow V; A fishing boat owned by the former First Sealord and last Viceroy of India, Lord Mountbatten. In September 1979, while onboard the boat in waters near his summer home on Ireland, a bomb planted by the Irish Republican Army exploded and killed him. – Rainbow Warrior; A Greenpeace ship sunk by the French foreign intelligence service in the port of Auckland, New Zealand, July 1985. Not an act of terrorism as such, but two French secret service agents was found guilty and sentenced to ten years in prison by the New Zealand court of law. – Achille Lauro; InOctober 1985,the passenger ship while on a cruise in the Mediterranean, was hijacked by four terrorists from Palestine Liberation Front, off the coast of Egypt. After only two days of negotiation, but after they had killed an elderly American passenger, the hijackers gave up when they were promised political asylum in Tunisia. However, justice was swift, as US warplanes forced the Egyptian airliner carrying the hijackers to land in Italy. As a result of the hijacking, the Convention for the Suppression of Unlawful Acts against the Safety of Maritime Navigation (SUA) was developed and adopted. – USS Cole; Although a warship, the modus operandi used by the attackers was kind of a harbinger, when in October 2000, a small craft laden with explosive commanded by Al Qaeda suicide bombers hit the US Navy destroyer. The attack killed 17 sailors and wounded another 42. Abu Sayyaf group, using a boat loaded with explosives, were the perpetrators. Supporters of the ISPS-code may argue that the code has been successful since there have been no serious maritime terrorist attacks since the implementation. Detractors may argue that the code did not help much in protecting seafarers against the menace of modern day piracy. Whatever opinion someone may have, the code was developed to protect the international community against terrorism, and as such it has been a success. Piracy and terrorism are different crimes, needing different approaches. And, according to conventional wisdom, the link between terrorist and pirates is very weak. Although a positive impact on the security situation by the Code, there have been some serious incidents. Like with all new regulations, ISPS-code was initially met with some skepticism from the end users, i.e. the seafarers. However, the code is now an accepted part of shipping, and the advantages are being appreciated. Obviously, the code can be modified to the better, by catering more for the threat of piracy and stowaways that are much more of real threats than terrorism. Lack of national legislation/guidelines on ISPS code implementation. ISPS code as a mean to address all maritime security threats. Deciding on an appropriate risk assessments methodology. Dissemination of good practices on port facility security. Ships` encountering difficulties after calling a high-risk port. Lars H. Bergqvist is a Swedish master mariner and a reserve officer in the Royal Swedish Navy. Sometimes referred to as “The Fourth Service”. International Convention Relating to Stowaways 1957 (“Brussels Convention”). -The development of the subject is admittedly amazing! The problem is not the code but the ship itself or the port. I think it may be time to revisit the design of ships-ports and to incorporate it in some security innovations. Let us remember that for example the terrorist attack in Oklahoma, with large numbers of dead and wounded, not by the force of the blast, but from the fragments. Since then it became almost mandatory to fit membrane in the windows to prevent fragments from the windows. Also adopted new rules for the construction of frames and mounting them. I think that more manufacturing interventions required for the security of vessels. Lars, good to your blog on CIMSEC and a nice to take a trip down the memory lane. Your opening sentence that most maritime regulations are reactive also has a connotation reactive regulation often create overlaps and conflicts with existing regulations, an area which seldom receives attention. As you have observed, ISPS Code was adopted and came into force with amazing speed. It follows that the fallout, in terms of debris of conflict must have equally amazing. Ten years down the line, it is high time that the debris – elements of FAL Convention e.g. seafarers right to free movement across boundaries – is restored. Too much attention has been paid to port security, a little is also due for the seafarers caught up in the frenzy. Excellent article Capt Lars and thanks Capt Suri for your comment. Seafarers and their families were and remain true victims of terrorism and piracy.. Wounds remain as Life goes on. Never Give Up, trust your Heart, Trust Lord. Very good and precise synthesis about the outcome and the implementation of the ISPS Code, whose meetigns I had the opporutunity to participe at IMO, taking part of the Brazilian delegation. I would add that , after the ISPS Code, later on, the 2005 Protocol to the SUA Convention completed the international security legislation frame. I have been working as an RSO field expert since 2004 and currently operate in Alsancak Group Security and Consultancy Co. Ltd. ISPS department. Some very excellent comments are placed in the article. I also share the same view about the question of “Who audits who?”. Alsancak Group Security & Consultancy Co. Ltd.